*Attached stuffed head with felt teeth in mouth detail. Taz here doesn't like to say much, but loves to get himself into mischief whenever he can. This hilarious Costume demonstrates just that with his big, wild mouth wide open. 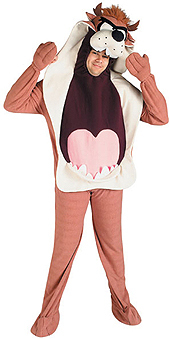 You too can be just as wild while you are wearing this Looney Tunes Taz Costume, perfect for any dress up party.